I have further evidence that ghosts exist (see the post Do You Believe In Ghosts? in the April folder). In that first post, I defined “ghosts” as unseen entities that can exert an influence on objects in the physical world. I have a cardboard box about a foot high with width and length dimensions slightly larger than a standard sheet of copy paper. I was going to use the box as a bin for storing recyclable paper. Anymore, Grandad doesn't believe in wasted motion so I don't wad a sheet of paper before dropping it in the box. I simply slip the sheet into the mouth of the box and let go. The first time I did this, I was amazed at the result. Check this video to observe what happened. Having been bitten and infected by the dreaded “science” bug early in life, all I could say when I first observed this action was, “That is so cool!” Again, those unseen entities I call ghosts were able to work together to slow the fall of the sheet of paper. 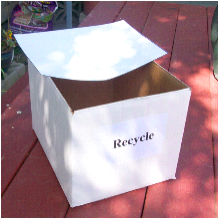 Help your kids or grandkids make a Ghost Box of their own. Find a box that is close to the dimensions of the box in the video, which are, 11 1⁄4" x 8 5⁄8" x 8 ". The “ghosts” are invisible air particles floating around in the box. 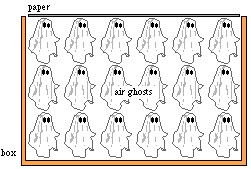 Let’s call them “air ghosts”. Even though unseen, they are quite capable of exerting an upward force on the sheet of paper, as seen in the video. When you slip the sheet of paper into the mouth of the box, the forces acting on the paper are gravity, which acts to pull it down, and the upward push of the air ghosts. The two forces are not balanced. The pull of gravity is stronger than the push of the air ghosts. The air ghosts can’t stop the paper from falling but they can and do slow it down. The upward force of the air ghosts is called air resistance. 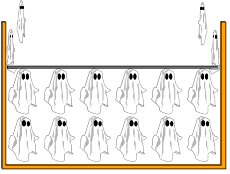 As the paper falls, ghosts are squeezed around the edges of the paper. It’s the fact that the escape route around the edges is small and restricted that reveals their presence. Ah ha! Even though I couldn’t see you, I know you are there! I think this is a wonderful example for kids to differentiate between observations and inferences! Ahh, the mystery of it all! Thank you for the great comment. The phrase "differentiate between observations and inferences" is so descriptive of the purpose of the activity. Grandad wishes he had said that but it's even better that you did.